A quick blog on today's amazing knock by AB. Here's the archive of Cricinfo's online commentary for the cricket match where South African batsman AB de Villiers scored the fastest ever ODI cricket century. Here are the stats. He batted just 44 balls for his 149 runs that included 16 sixes. 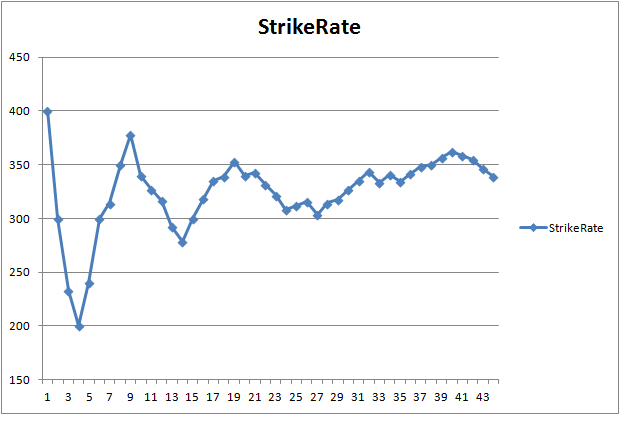 Here's a graph of his cumulative strike rate throughout the innings in runs per 100 balls. His highest cumulative strike rate was 400 after the first ball, and thereafter, the lowest it ever reached was 200, after 4 balls. His first fifty took 16 balls, and his second fifty was even faster, coming of just 15 deliveries, giving him the record 31-ball century. He scored no runs of the last two balls he faced, causing his final strike rate to dip below 350 and end at 339. AB was at the crease for just 44 minutes. In comparison, the slowest international hundred (in test cricket, which can be very different) in history consumed 557 minutes. As far as instantaneous strike rates throughout the innings, we can observe a 13-ball stretch (28th to the 40th ball) where he scored 63 runs to move from 82 to 145, at a strike rate of 485 - suggesting that in that period, like Viv Richards, AB was in two minds - whether to hit the bowler for a 4 or 6. Here's a grainy YouTube video of today's innings. The previous fastest ODI century consumed 36 balls, which yields a strike rate of less than 300. AB's final strike rate in this innings is higher than the expected book-cricket team strike rate of around 325. 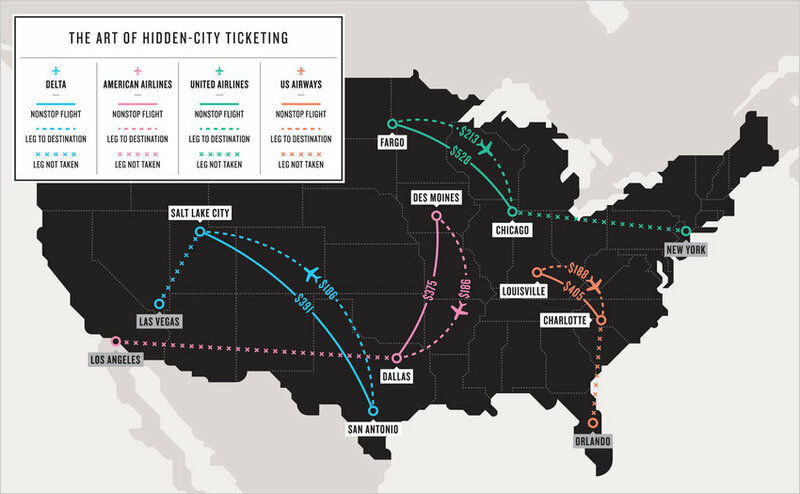 The article quotes a NY times post that explains HCAT nicely and ends like this: "If you want to travel to Dallas, the best way to get a reasonable fare is to book the flight to Los Angeles instead, and simply get off the plane at Dallas." The passengers don't appear to be doing anything illegal by getting off. Nobody has been arrested yet, at least. The airline is within its rights to employ all legal means to curb this practice. UA is suing a 22-year old for his website that seems to help people with HCAT. Some of the reader comments in response to these HCAT articles are interesting. Is this seemingly weird pricing structure a rare but predictable outcome of optimally managing fares for a hub-spoke network? Or is it due to some less-than-realistic assumptions underlying the combinatorial optimization formulations within their revenue management, fleeting, and schedule planning models? Consider the hotel analogy: Do hospitality RM systems create situations where one can purchase a cheaper hotel stay for 3 nights including a weekend but check out on Friday night? Surely one would expect a price consistency-check layer in place that would prevent such a scenario. Of course, when one has to consistently price to maximize revenue expected from predicted demands for millions of different itineraries, it can get quite complicated. In OR revenue management practice, we have had to build pricing engines to manage request-for-quotes (RFQs) for a bunch of items that often involve complex demand interactions. If the customer is allowed to cherry-pick and is not bound to an all-or-nothing type bundle deal, the pricing optimization analytics we develop will naturally have to account for this. While life would be so much more easier if customers did not cherry-pick, explicitly blocking cherry-picking is not a great idea since it completely eliminates customer flexibility. Customers will simply take their business elsewhere. Thus, one option is to manage cherry-picking using 'soft' constraints. "they will serve you a better, stronger Cappuccino if you want one, and they will charge you less for it"... but why does this cheaper, better drink ...languish unadvertised?... Businesses try to discourage their more lavish customers from trading down by making their cheaper products look or sound unattractive...the bottom end of any market tends to get distorted" As far as I know, Starbucks has not blocked the book authors. The book mentions how & why, in the early days of the railway, in some places, a 3rd class carriage was deliberately left roofless even though it was pretty cheap to build one. The customer utility of the least profitable option is (ruthlessly) reduced, enough to discourage trade-downs but not bad enough to lose their economy customer segment to competitive options. Thus, if you want to deplane at Dallas, it seems that you will have to take your chances and not make it a habit. If we try to advertise or game this, it is apparent the companies are SCM-bound to come after us and make HCAT a most unattractive option.